Transit ridership will get a big boost in Utah County. (Al Hartmann | Tribune file photo) Student climbs aboard UTA bus at President's Circle stop at the University of Utah Monday August 13 2012. Beginning next August, about 100,000 Utah County residents will receive free Utah Transit Authority passes annually for at least a decade — thanks to deals between that agency and Brigham Young University and Utah Valley University. “This is an effort to provide a service to our campus community that will also reduce congestion and promote clean air in the valley,” said BYU President Kevin J. Worthen. The announcement came on a day when an inversion trapped dense smog in valleys along the Wasatch Front. It was also made, appropriately, at the corner of University Avenue and University Parkway. Both schools are providing free passes to all students and employees — plus their spouses and dependents. UTA spokesman Carl Arky said each university will pay $1 million a year for 10 years for the deal. Combined, free passes will be given to more than 100,000 people annually, officials figure. The passes will be handed out in August as UTA launches a new $190 million Provo-Orem bus rapid transit system ($40 million of that went for highway improvements). That project has been controversial, and some local groups lost court challenges that sought to stop it. UTA also ran into an $11.3 million cost overrun, and is issuing new bonds in part to cover that. 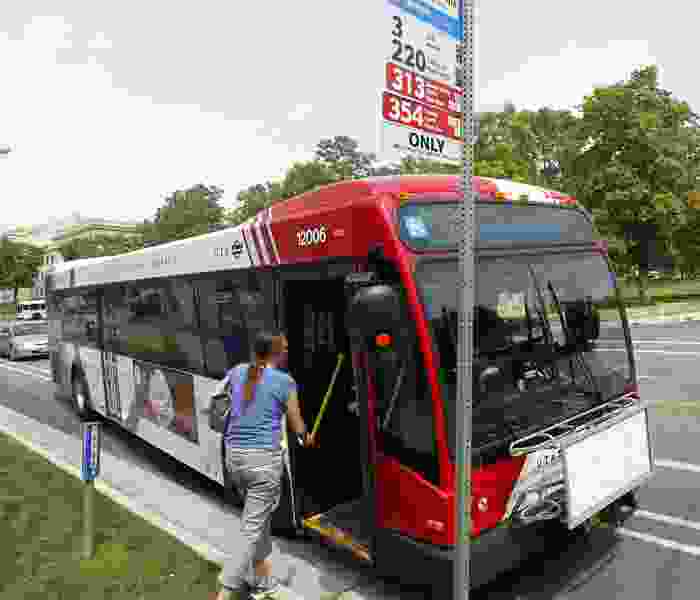 Bus rapid transit is described by UTA as “TRAX on rubber wheels,” where passengers buy tickets from machines in advance. Extra-long buses will have bus-only lanes for about half their 10.5 mile route. Buses may receive priority at traffic signals and would come every six minutes at peak travel times. UTA figures the BRT may take thousands of cars off the road each day, and reduce pollutants by more than 400,000 pounds annually. New passes will allow access to BRT, plus other UTA bus and rail services, including FrontRunner and TRAX. Universities said the early announcement about the passes gives them time to transition to a new card system, and more information will come over the next eight months. Also, it lets incoming students make better transportation plans for the next academic year. “We’ll have many who will not need to bring their cars to this valley,” said Jan Scharman, BYU’s student life vice president. Holland said the UVU contract will be covered by reallocating a combination of existing revenue, including the existing UTA student fee fund, employee benefits funding, and parking pass revenue. UVU will increase the cost of an annual parking pass from $90 to $115 to help cover the cost; however, current student fees will not increase.